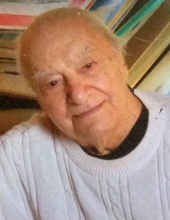 Louis J. Pugliese, 97, formerly of Providence passed away at the Rhode Island Veterans Home in Bristol on March 21, 2019. Louis was surrounded by a very caring staff at the Veterans Home and loving family members. Born in Providence he was the son of the late Josephine Curci and John Pugliese. Louis attended St Pius School and graduated from LaSalle Academy. He joined the United States Army during World War II and served as an officer in the Air Corps. He was honorably discharged, attended MIT and graduated with a degree in engineering from Brown University. Louis enjoyed a long career in building architecture. He was known for his many talents, strong work ethic, love of music, philosophy, and the sciences, as well as for his intelligence, intuition and creativity. Louis was very artistic and had a passion for drawing and painting in watercolor. He had several exhibits of his work in a variety of settings in the community. Louis is survived by a son, Louis J. Pugliese; three daughters, Alix Stockwood, Marianne Warren, and Claudia DeCesare, a sister, Mary Falk, nine grandchildren and eight great grandchildren. He was the brother of the late James Pugliese, Domenic Pugliese, Julio Pugliese, and Charles Pugliese. According to his wishes, his body has been donated to the Brown University Medical School. There will be a funeral Mass on Saturday, April 6th 2019 at 10AM in St Pius V Church, Eaton Street, Providence, Rhode Island. Burial will be at the Rhode Island Veterans Cemetery in Exeter, Rhode Island at a later date. In lieu of flowers, donations in Louis’ memory may be made to The Rhode Island Veterans Home Chapel Fund, 480 Metacom Avenue, Bristol, RI 02809. Condolences may be left at monahandrabblesherman.com. To send flowers or a remembrance gift to the family of Louis J. Pugliese, please visit our Tribute Store. "Email Address" would like to share the life celebration of Louis J. Pugliese. Click on the "link" to go to share a favorite memory or leave a condolence message for the family.